This cemetery is separate from the Walnut Grove Cemetery. It was located behind the Walnut Grove Presbyterian Church. The church building has been removed. The church was established in 1852 by Rev. W. B. Wear under the name of Sway Back Union Congregation of Cumberland Presbyterian. Many of its early members are buried in the Wear Cemetery, which is about 1 mile west. The church building was torn down in 1994. The windows from the old building were installed in the Foote Baptist Church, which was moved to Chestnut Square in McKinney where it was renamed the Chapel at Chestnut Square. It is owned and operated by the Heritage Guild of McKinney. The cemetery was started in 1851, although no stones remain from that time. The listing for the Old Walnut Grove Cemetery is at the end of the listing for the Walnut Grove Cemetery in COLLIN COUNTY CEMETERY INSCRIPTIONS I. For more information, see the write-up for the Walnut Grove Cemetery. This cemetery is on about one acre of land. It is heavily wooded with several large cedar trees. The stones are very old. There are a couple of iron markers. Many of the stones have disappeared since the visit in 1972 for COLLIN COUNTY CEMETERY INSCRIPTIONS I. There are footstones stacked against a tree with no matching headstones. One notable stone that has disappeared is a tall monument for an Indian chief and his horse. The grounds are well kept. This cemetery appears to be older than the Walnut Grove Cemetery on the hill. Wilson Creek is on the north side of the cemetery. The historical marker for the church has been moved to the Collin County Museum in McKinney until it can be decided what to do with it. 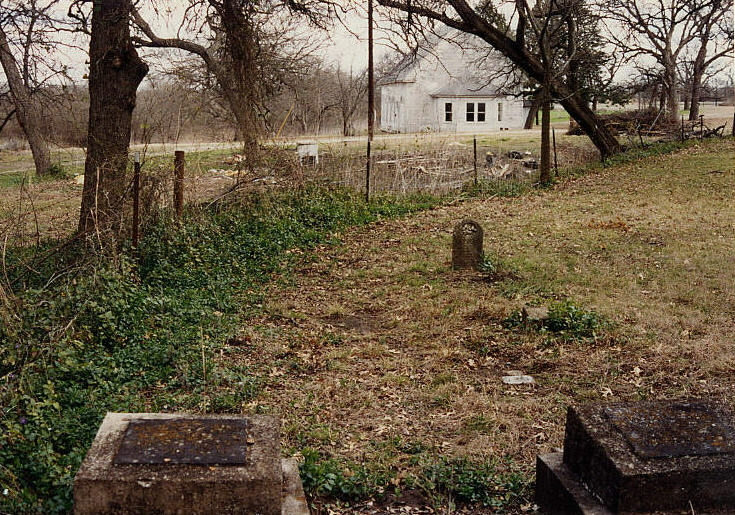 The land for the church and cemetery were deeded by the Rhea brothers of Rhea's Mill in Vol 9, p 424. 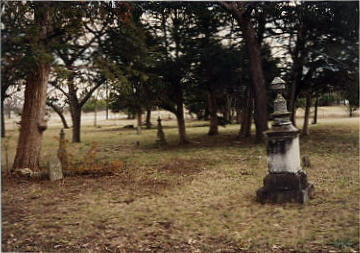 In February of 1995, this cemetery was deeded to the Walnut Grove Cemetery Association with additional land connecting the two cemeteries. The cemetery association is currently selling lots in the new addition. Also the land along the creek bank was bought and given to the cemetery association. This cemetery should start receiving the same perpetual care as the other one. Since this cemetery is now part of the other one, the entrance may be through that cemetery. The Walnut Grove Church in the distance was razed in 1994.